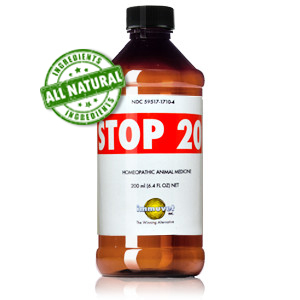 Stop 20® is a carefully developed product designed to reduce the incidence and severity of Exercise Induced Pulmonary Hemorrhage (EIPH), commonly known as Bleeding, in performance horses. 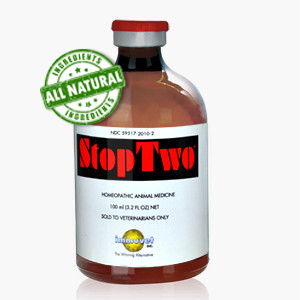 Stop 20® is recommended for all high-performance horses (race horses, trotters, pacers, polo ponies, show jumpers, rodeo performing cattle horses, etc.) that exhibit performance deficit associated with EIPH. Strengthen and protect the capillary blood vessels within his lungs. Increase weight gain and alertness. Enhance his performance after completing the administration of the product for 20 days. Shake each bottle vigorously 10 times before drawing 10ml dose. 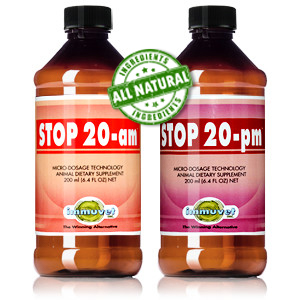 Give 10cc of STOP 20® to your horse in the morning on an empty stomach 30 minutes before feed for 20 days. Avoid great efforts and DO NOT BREEZE your horse for the first 20 days of supplementation; only light training (walking and/or light jogging) should be practiced during the first 20 days. Normal training can be resumed after the first 20 days of supplementation Your horse is ready to race at any time after day 20. We strongly recommend administering the dose under the tongue to allow for maximum absorption. Keep this product away from sources of energy, heat, and light. Do not mix different products in the same syringe. International (outside the USA) customers must pay applicable sales tax, duty and Customs charges. Your local government determines duty and Customs charges, which varies by country. We only ship within the USA and Canada. For International shipping, please contact us.